AlphaOil Shaving Oil employs SSE, our unique Shave Surface Enhancing technology throughout the shave giving excellent razor performance and glide. ï¿½ Use on its own instead of gel or foam, or combined underneath your gel / foam. Great as a pre-electric too. 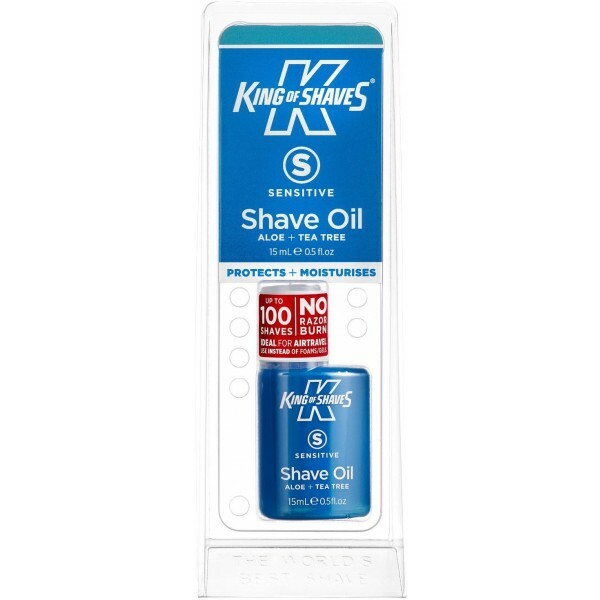 ï¿½ Up to 100 shaves from one bottle. ï¿½ Totally clear formula allows you to see exactly where youï¿½re shaving ï¿½ perfect for shaping sideburns, goatees and for avoiding problem areas. ï¿½ Dermatologically tested and unfragranced. Ideal for sensitive skin. ï¿½ 15 ml. PP Cap. PE Plug. PETG Bottle. PVC Pack. Card Inner. Made in the United Kingdom. King of Shaves products are tested humans, not animals.